100TB.com Continues to Push the Envelope With Low Prices on Intel E5 Servers - Known for industry changing product offerings, 100TB.com continues its reputation with Intel’s newest E5 product family of dedicated servers at unbeatable prices. Keeping with their reputation of high bandwidth, latest technology, and low price dedicated servers, 100TB.com adds Intel’s newest Xeon E5-2600 product family to their server line-up. 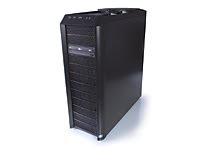 Heralded as the best product family to date, the E5 product families are sure to cause a change in the dedicated server market. 100TB.com has a deep history of market changing products. The name of the company itself reflects an offering their competitors are still trying to achieve: 100 terabytes of top tier bandwidth included with every dedicated web server. Adding the Intel Xeon E5-2600 product families to their current server line-up, and pricing strategy, is hard to beat. The Xeon E5-2600 product families deliver higher performance, efficiency, and security than the prior generation. The new servers optimize I/O throughput and reduce data latency by 30 percent. Running on 100TB.com’s world-class network, the E5 family eliminates network bottlenecks and increases network effifiency. Fluance® Introduces New Tower Speaker Docking System, Value Unmatched in its Category - Fluance is proud to introduce the FiTSD600 2.1 Wood Tower Speaker. Following the success and technological innovations of the FiSDK500, the FiTSD600 delivers serious performance in sound, functionality and design. Fluance is proud to unveil the latest edition to the successful Fi Series with the FiTSD600 2.1 Wood Tower Speaker Dock for iPods and iPhones. The second member of the elite Fi Series and successor to the FiSDK500 High Performance Music System, the FiTSD600 is a floorstanding loudspeaker with a built-in docking station for iOS devices and has multi-functional features for the diverse Fluance consumer. The FiTSD600 is available for purchase through Fluance.com. The FiTSD600 wood tower speaker was designed for music lovers and audiophiles with their need for high quality sound, functionality and design in mind. 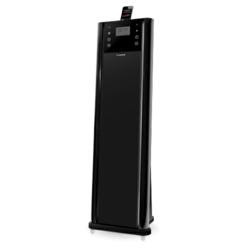 Made with audio-grade MDF wood and a glossy piano-black finish, the FiTSD600 combines the three-way power of a tower loudspeaker with the innovative technology of an iPod/iPhone docking system. The high quality components that Fluance is known for using are found within the FiTSD600, and the sound engineering ensures exceptional sound reproduction with dual premium 3” midrange drivers, two ultra high-end tweeters, a front-firing 6.5” subwoofer, and a powerful built-in amplifier. “The FiTSD600 is a step up from our top selling FiSDK500 speaker dock. We’ve truly created something different with this tower speaker system: something powerful, something affordable and something incredible” says Deepak Jain, President of Fluance Speakers. “The sound that comes out of this system is simply amazing.” Providing room filling full range sound the FiTSD600 is both a revolution in design and sound engineering at a value unmatched in the iPod/iPhone docking system category. This latest speaker system from Fluance connects digital media on a whole new level. Android and other smartphone users can connect their digital devices, with the included cables, to the FiTSD600 through the auxiliary input, and view videos and other media on HDTV by connecting to the FiTSD600’s video output. New additions to this Fluance Fi Series model are the full display with built-in FM radio and alarm clock, a heavy duty handle for easy mobility, and two ways to control the FiTSD600: a touch panel full display or compact remote control. This newest Fluance speaker system accommodates diverse lifestyles while representing Fluance’s dedication to value and serious performance. Seneca®, a leading manufacturer and distributor of innovative technology solutions, announced today the availability of the Nexlink® 7900 Workstation powered by NVIDIA® Maximus™ technology. The Nexlink 7900 workstation is available in a series of preconfigurations designed to meet the needs of a range of clients, from value-conscious designers to the most performance demanding users. NVIDIA Maximus-powered Nexlink workstations combine the visualization and interactive design capabilities of NVIDIA Quadro® professional graphics processing units (GPUs) and the high-performance computing power of NVIDIA Tesla® GPUs into a single workstation. With Maximus, the Tesla companion processor automatically performs the “heavy lifting” of photorealistic rendering or engineering simulation computation. This frees up CPU resources for the work they are best suited for – I/O, running the operating system and multi-tasking – and frees up the Quadro GPU to be dedicated to powering rich, full-performance, interactive design and visualization. Designers and engineers can now perform simultaneous CAE, rendering or structural/fluid analysis on the same system being used for design work, and digital content creation professionals can perform faster video editing, effects and animation. Zhongtian Lighting Introduces the New Product 80W LED Flood Light - Zhongtian Lighting introduced its new product----80W LED Flood Light. This model is upgraded for many aspects. Firstly, its light body is composed of high quality aluminum radiator, high-purity aluminum reflector, and high-strength tempered glass, sealed with anti-aging silicone rubbers. Secondly, its effective thermal diffusion reduces the lamp body temperature, which makes LED flood lights possess the best working condition, so as to ensure the light source and service life. It is widely used in the markers, stadiums, squares, billboards, parking, and other outdoor places. Compared with traditional lamps, service life of LED flood light is 60 times as that of incandescent lamps, 12 times as that of energy-saving lamps and fluorescent lights. Its long service life greatly reduces the maintenance cost and saves the material and labor costs. Besides, it can be installed in anywhere without any restriction. It is widely used in the markers, stadiums, squares, billboards, parking, and other outdoor places. AudioXperts, the new luxury audio brand, committed to delivering unique audio solutions, introduces the first two models of its 4TV collection, designed to provide users with extraordinary TV/music solutions that truly eliminate the confusion, chaos, and clutter that too often comes with typical component home theater systems. With their beautiful smoked glass and aluminum enclosures, these ultra-low-profile products provide amazing component-level audio performance, in two unique, easy-to-use models: the Model 5122 5.1 Surround Sound Console (MSRP $3,999.99), a category-defining, 2-piece, true 5.1 channel music and surround sound system with wireless subwoofer, which offers the performance of a high powered 12” subwoofer, and offers several placement options, including standing upright with the included feet, lying flat for versatile, inconspicuous placement, or even placed directly underneath the 5122 main console; the Model 2112 Virtual Surround Sound Console (MSRP $1,999.99), a single-piece, high performance 2.1 channel music and surround sound system with built-in subwoofer that delivers the equivalent bass output of a separate 8” powered subwoofer. 4TV home entertainment consoles are designed to fit directly under the TV, or on top of a furniture cabinet below a wall hung TV set, and feature stunning smoked glass and aluminum enclosures that integrate perfectly with today’s televisions. 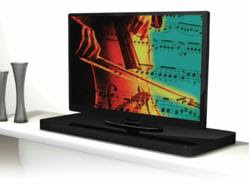 Unlike sound bars and conventional surround sound systems, which are typically fixed into place, the 4TV console's built-in swivel base improves the user's television viewing experience by allowing them to easily rotate the console and television to the preferred listening and viewing angle. The units feature backlit top-mounted, touch-sensitive controls and “learn” existing remotes for easy transparent operation. A proximity sensor adds an even greater ease-of-use, automatically detecting when someone is near and instantly lighting up to show the systems status on the control panel. The home entertainment systems feature patent-pending H.A.R.T. (High Aspect Ratio Transducer) driver technology which utilizes a unique suspension and support system that allows the use of a large voice coil for high power handling in a high aspect ratio design. By incorporating these new drivers the height of the 4TV consoles can be kept to less than 2-1/4". In addition to providing high quality audio from the listener's TV, cable/satellite box, and gaming consoles, by offering Dolby Digital and DTS decoding, 4TV products are also designed to provide extraordinary music enjoyment by incorporating easy wired or wireless connectivity to all of today's popular music sources with, instant connection for an optional Apple® Airport Express®, or wireless streaming with any Bluetooth® enabled device, and incorporates the new CSR® aptX® codec for crystal clear, full bandwidth performance. To optimize the listeners experience with any content, 4TV can easily switch between a number of listening modes and EQ settings for both movies and music. In Movie mode listeners can experience all the action with full and realistic surround sound. In Music mode, music can be experienced in true and accurate stereo sound. For those owners that may experience sensor neural hearing loss, the 4TV’s Enhanced-Dialogue listening mode offers a separate equalization setting that our engineering team developed using data derived from the U.S. Hearing Journal Research. “Because of its unique industrial design, our 4TV products will naturally catch the attention of anyone with a sense of style, however, what will really capture their attention is the amazing performance of these systems.” said John Fischbach, director of product voicing for AudioXperts. Main Unit Dimensions (H x W x D): 2.08" x 50.47" x 17.20"
Main Unit Dimensions with Swivel Base (H x W x D): 1.75" x 50.47" x 17.20"
Subwoofer Dimensions (H x W x D): 2.05" x 50.47" 17.17"
Main Unit Dimensions (H x W x D): 2.13" x 40.24" x 17.20"
Main Unit Dimensions with Swivel Base (H x W x D): 2.56" x 40.24" x 17.20"
Far End Gear Introduces the First Line of Reflective Earphones - Far End Gear announces the release of Brite Buds Reflective Cord Earbuds. The first line of earphones specifically designed for visibility in low light. Far End Gear™, creator of earphones and accessories designed for outdoor enthusiasts, is first to market with a line of reflective cord earphones, developed for those who engage in nighttime activities such as jogging or cycling. 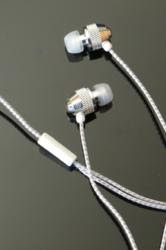 Employing the same line-strengthening process used in creating parachute cord, Brite Buds™ Reflective Cord Earbuds weave water-resistant fibers with glass bead retro-reflective threading; resulting in increased cord strength and greater visibility at night. Brite Buds come in both a standard, stereo model and a single sided, stereo-to-mono version mixing both channels of sound from a stereo audio device into a single ear — enabling the wearer to maintain alertness in any environment. Far End Gear Owner Kevin Goldstein stated, "Making yourself visible while exercising in low light conditions is important. Adding reflective accessories to your gear can help you stand out from the background." Professional BMX rider Brian Kachinsky tested the Brite Buds single-sided earbud during the product’s development and remarked, "I always ride with only one earbud in. Not only does [this] sound better than listening to half of a stereo set, but the reflective cord is a nice touch. And it’s held up to some serious abuse." Editors also reviewed models from the next series down with this comment about the super-value oriented Toshiba 50L5200U, “The 50 inch LED/LCD offering size has never been done before this year with this model. It's obviously there to offer competition to plasma TV 50” size offerings. It is a good choice even at $999 for brightly lit rooms especially ones that have light from windows if you plan on doing a lot of daytime television viewing. 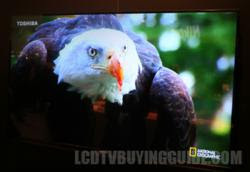 There are hardly any other 50 inch LCD/LED TVs to compare to as other manufacturers make 47” and 55 inch TVs not daring to compete with the 50” plasma TVs on the market. A good comp in plasma would be the Panasonic TC-P50UT50 which sells for $899 and has a better, though dimmer picture as well as 3D, and Smart TV function. Still, I give this TV over a 9 in value due to the sheer lack of competition in LED TVs in this size and because the picture gives you the positive attributes of LED if that's what you need.” And similar comments about the Toshiba 46L5200U , “At $799 this is a great value model in the 46/47” sizes range.